Scotland has gone "too far" on universal benefits according to the Scottish government's poverty advisor. 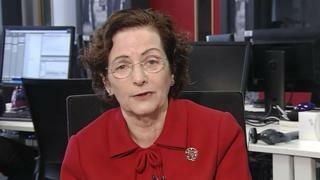 Naomi Eisenstadt told the BBC's Sunday Politics Scotland programme there should be more "targeting" of public money towards those who need it most. A independent report by Ms Eisenstadt, published earlier this week, urged the Scottish government to end the council tax freeze in 2017/2018. Ministers said they were committed to their universal benefits policies. Universal benefits include things like free prescriptions, free school meals and tuition fees. Speaking on the BBC Scotland programme, Oxford University research fellow Ms Eisenstadt, said: "All universal benefits help everyone, not just the poorest. "The difficulty is that there is a balance between the bureaucracy in administering means tested benefits, and sometimes the stigma associated, against how do you spend your money most effectively. "I think we have gone too far in Scotland on the universal side and not far enough on the targeting. "I think on the targeting we need to make the culture of public services more respectful and therefore avoid stigma that way." Ms Eisenstadt, who was appointed by Ms Sturgeon in 2015 to provide advice on poverty and inequality, said she thought it was "wrong" that she got the winter fuel subsidy and that "in times of austerity" some pensioners had "benefited enormously". The Smith Commission has recommended control over the winter fuel payment, which currently rests with Westminster, is transferred to the Holyrood. The poverty advisor also reiterated her view that the council tax freeze "does not help poor people". She said: "It does help better off people because housing hasn't been revalued for the last 25 years, so people living in the most expensive properties, where they have gone up in value, their taxes haven't changed." "The reason it's a disadvantage to poor people is that local authorities need the funding to fund services that mainly help the poorest people. "I think that local authorities need more discretion over their spend and the way they get that discretion is by deciding for themselves what to charge for property tax." Speaking at the launch of Ms Eisenstadt's report on Wednesday, First Minister Nicola Sturgeon welcomed her findings and said the government would "look at what we're doing well, and where we can improve". Responding to the advisor's latest comments, a Scottish government spokeswoman said: "We remain committed to our universal benefits policies such as free school meals, prescriptions and tuition fees to tackle inequalities. "We welcome Naomi Eisenstadt's report and we will respond formally to it before the end of March, setting out how we intend to take forward its recommendations."